I occasionally see sensational headlines about how you can make potato chips in your microwave. That is bunkum, I say. I tried it out, just to be sure, and the results were as ridiculous as I expected. I got cardboardy, chewy potato slices with some occasional hard spots. My kids did eat them (I mean, I called them “chips,” so what’s not to like? ), but they weren’t good. And they took a while to make, what with having to check and remove “crisp” specimens then re-microwave the rest. Luckily you can only make a plate at a time, so the damage was limited to half a potato. You want chips without a deep fryer? THIS is the recipe for you. We do this with regular potato slices as well (I keep promising that potato chip pizza recipe), but for eating on their own these sweet potato chips are the best. They crisp up right through, you can make two big trays at a time in the oven, and they are a sweet and salty side or snack. Crunch, crunch, crunch. 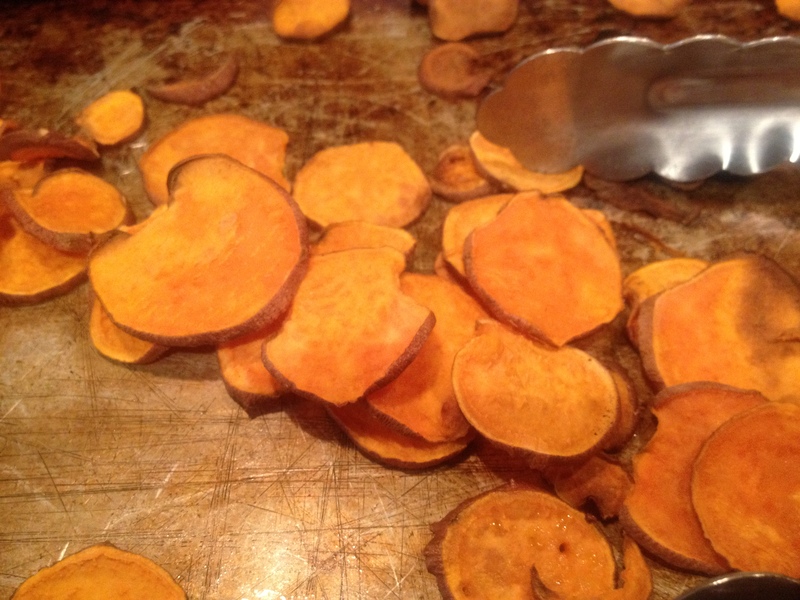 Baked Sweet Potato Chips: Slice as many sweet potatoes as you want into 2mm slices. Toss and rub well with a drizzle of olive oil and a good sprinkle of salt. Spread in a single layer on one or more cookie sheets. Bake at 450 until crisp, checking frequently after the first 10 minutes, and rotating pans top to bottom if you have more than one. Remove chips as they crisp up and return the rest to the oven to continue baking (you may learn where the hot spots are in your oven!). This entry was posted in DIY, Feeding Kids, My Favorite Recipes, Snacks and Apps, Vegan or Would-Be-Just-As-Good-Vegan, Vegetables By Themselves and tagged cooking, DIY, family, food, homemade, kids, lifestyle, recipes, vegan, vegetarian on March 28, 2012 by emmycooks. Oh boy these look good! So good. I pretend to make them for my kids, but…. A very simple way to get yummy chips. It is simple. Simpler than the microwave, it turns out! I figured that microwave potato chip stuff had to be bunkum (great word by the way). But glad you checked it out to be sure so I don’t have to! You’re welcome! :) I am happy to be of service in the chip-testing department any time. You are so welcome. I definitely owe you in exchange for all of YOUR good tips! Gosh – microwave potato chips? I mean, the appliance is an amazing piece of equipment and I couldn’t live without it, but… These chips look so good! True, true. I do like my microwave for other things–but not, as it turns out, potato chips. I love potato chips! I haven’t made them at home before, and I never really gave much thought to how easy (and much healthier) they are to make in the oven! Thanks for the great recipe. I will be making these soon! Going on the menu for next week. We love sweet potatoes and are always looking for another way to prepare them. Always good to have another veggie dish for my picky eater! Thanks for posting! I’d think microwaved chips would just get limp, wouldn’t they? Ick! But I love the baked chips idea. I usually cut thicker chunks and make sweet potato steak fries. Love using these chips as garnishes, but we always deep fry! But it looks good baked as well, so we should definitely give the healthier version a shot! These look irresistible! So many recipes to try ….. what a nice challenge to have! Yum, these look great. 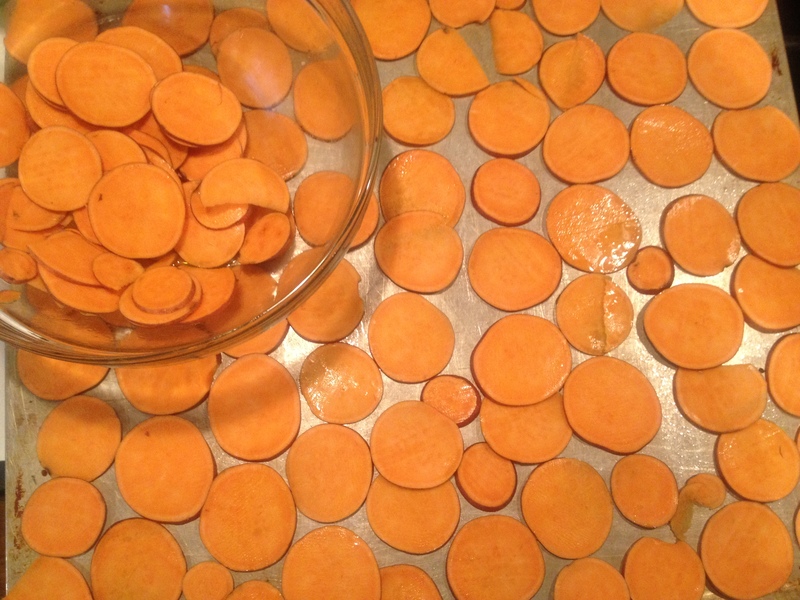 I make kale chips all the time, but I need to remember that I can do the same thing with (sweet/) potatoes too! : ) Hm, my guess is that radishes will always be better raw… but turnip chips (or parsnip chips?) sound like a good idea! You are obviously a sweet potato fan! I like chili powder on mine too, I will have to try adding garlic powder as well. Thanks for the suggestions!